You envision the reality you want, as if it is in the now and even - or perhaps especially - be grateful for it! That's creating from the God/Spirit level, the spark of God that you are. Yes, you start from lack (want) but you don't move forward in lack. Many, many people have found this does make a difference in this material world... it's not just wishful thinking. Also this process gives the feeling that what you want is achieveable, desirable. You feel abundant, and like attracts like, a kind of magic. The Law of Attraction, "LIKE ATTRACTS LIKE." It's a spiritual law of the universe. This may seem to be contradicted by the observation that opposites attract. "If like attracts like, then how can opposites attract?" you might ask. The reason is that opposites attract only to make a completed whole entity that needs both aspects to function well. This is an example of the principle, "NEED ATTRACTS FULFILLMENT." For example, man attracts woman in order to make a complete unit. Once the whole partnership is made, it then attracts other completed entities like itself. So we see that married couples tend to attract and associate with other couples who are like themselves, not opposite to themselves. Similarly, it is a common observation that partners in a business frequently bring different personality traits to the business. But this is simply to make the business a complete entity, capable of surviving. Once the business entity is complete, it tends to attract others that have an affinity for the business, not those that feel the opposite. As a result of the Law of Attraction, magical results come about. Of course this "magic" is not really magic; if it happens then there must be science to explain it, albeit not the orthodox. Metaphysics is a super-set of physics, not its enemy. Perhaps Sheldrake's theories of information fields are the closest - I perceive it more in the order of information/thought than about energy/vibration - it's in the zero-point, the implicit encoding of the holographic universe. But then they are two sides of the same coin anyway, as in the case of gravity; whether potential or energy, either way it has a field of influence through the interaction of space and time. 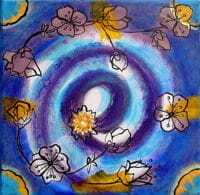 The implicit, hidden world is that of creative potential, of Spirit, outside of space and time; the real world is its explicit manifestation through creativity; and the mind is the intermediary, interpreting intuitions and drawing up plans of action. Therefore, I think for most of us the Law of Attraction works at the mental/spiritual level, not the physical. But also Spirit has the power to align causes and effect sequences right down to the material level. Each person is an independent cause but also they are part of the universal Spirit or Source and in this respect they act as One too. Telepathic influences on others and their resulting actions cause events to occur and things to appear as if by magic or synchronicity. But it's not really magic, it's cause and effect. Spirit works on matter through mind and actions. Real action needs to be taken to manifest real things... there are such solid agreements cementing the physical: a lifetime's conditioning and learning to play "the game of life." It wouldn't be much of a game if any of us could easily change the rules or alter the playing field! We have the potential of being games makers, and I believe we should rise to that, but when we play football that's what we do. Even if you discount the spiritual, I also think the Law of Attraction has a psychological basis. Your every thought and word is contributing to your life experience. For openers, your thoughts produce your emotions that, in turn, result in how you feel about a particular event occurring in your life. It has always amazed me how people can walk around feeling a particular way and not understand that it is their own thoughts, or more accurately what they are telling themselves that is producing the feeling in the first place. This is why two people can look at the exact same event and have opposite feelings about it. You are creating your own subjective reality, moment by moment, with the thoughts you choose to think and what you say, both to yourself and others. And through the power of spirit - the controversial bit - your subjective reality impinges on the physical reality. With the blocks removed about considering it's OK to be/do/have whatever, you can then more easily do what ever it takes to manifest it. It's the Robert Fritz creating principle: a crystal clear vision inspires and energizes the path of least resistance to your goal. Your current abilities and having are irrelevant to you being able to start creating; that's where you're going and you now - with that empowering vision - have the energy to work through any barriers, and acquire any necessary skills and resources along the way. That's why the vision has to be genuine, specific and what you truly want, and any blocks and conflicting beliefs that you may hold need to be exposed and released. Otherwise wishes and prayers can be, in effect, the avoidance of a reality that one is unwilling to confront. But if it's genuinely your vision, and in accordance with the knowing of your Higher Self, it will happen, and you won't be able to stop yourself running around like a wild thing making it happen - since YOU are the most important channel of your creative power, just as much as the world around you. Many people sincerely wish for their life circumstances to be different, to win the lottery or to obtain promotion. Most of the time this doesn't come about - "wishful thinking" or desire doesn't cut it and one suffers. What is needed is creative intention or will, not just a wish or desire. It's the process of manifesting and it needs to be done without attachment, and it needs to be followed through with the correct attitude and actions. When the Buddhists speak of desire as something to overcome, in order to prevent suffering, they mean the attachment to a possession or an outcome, such that you can't be happily without it. Buddha was right, but it's not desire itself that he was warning about, it's attachment to the outcome or object of desire. So as a result you have a fear of not attaining it or of then losing it. So you put force and effort in there. Force results in counter-force, a reaction. That acts as a counter-intention and nullifies the intention. Nothing happens. 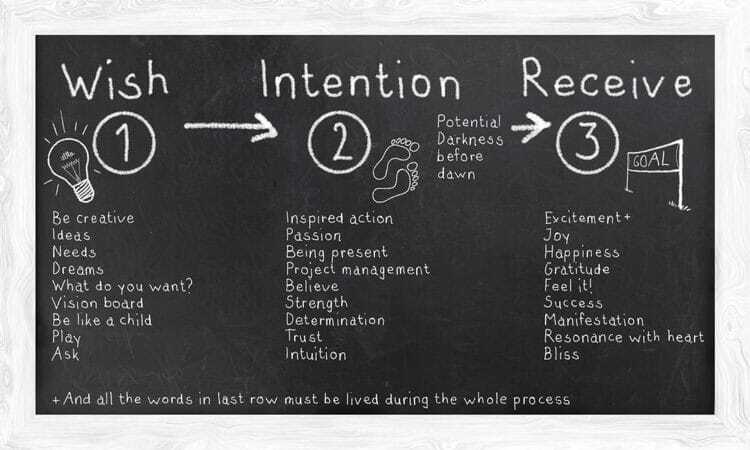 Manifesting intentions needs to be effortless and without attachment to the outcome, i.e. with unconditional love and gratitude but not with fear or greed. That suffering one normally feels when your desires do not manifest is from an attachment of some sort, the source of the counter-intention. It was not a pure intention, it was undermined by counter-intentions, feelings that point in quite the other direction. Subconscious forces, such as hidden conflicting beliefs and suppressed fears, are resolved only through deep introspective work on oneself. And one's ethics neared to be cleared, such that one feels more worthy of the exchange of wealth for value that you have created for others or services done. One also needs considerable emotional intelligence, intuition and creativity - because we have to clear our intentions, be open to guidance and play an active part in the manifestation process. It's not so much a "magical" process as a way of being that is quite foreign to most people. The average guy just does not realize that he can change his actions, feelings, thoughts, beliefs and identity. Instead they are perceived as the result of influences upon him, so he feels moulded and at effect, with few choices. Life just happens to him, and it's all other people's fault. The truth - that he is responsible for the quality of his life - is, in that context, a revelation. Because if he's responsible then he can change things around.